BERKSHIRE snooker ace Matt Ford is on course for a unique double. Exceptional long potting helped the 40-year-old from Bracknell (pictured) secure the fifth leg of the Cuestars South of England Seniors (40+) Tour. He replaced defending champion Mike Talmondt at the top of the Seniors rankings after a 2-1 victory over Richard Swaffield in the final at Chandler’s Ford Snooker Club. Ford took an eight-minute first frame with runs of 39 and 42 – and restricted his opponent to nil points. Salisbury-based Swaffield levelled the match on the blue but needed snookers with two reds left in the decider. He admitted that Ford’s excellent long potting was the key factor. “Long potting is my strength,” said Ford, clutching his £120 prize money. “I’ve never had coaching. I’ve been playing the game for a long time now and it’s always come naturally to me. Indeed. He dropped just one frame all day. 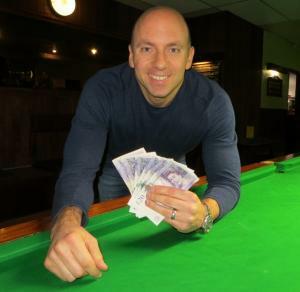 And he had gained a “bit more confidence” three days previously by beating his Championship Tour rival Ryan Mears in the final of the Byfleet league’s individual knockout. “That was a surprise,” said Ford, trying desperately to suppress a smile. On his Cuestars debut, Birring progressed to the last-four before coming up against Ford. Nick Birney (High Wycombe) suffered his second successive semi-final defeat. Paul Stenning, who turns out for Park Gate RBL A in Southampton’s Super League, compiled the day’s highest break of 90 – against Paul Lawrence, who happens to play for Park Gate RBL B.
Third-placed John Hunter made a 2-0 quarter-final exit to Swaffield, who had also lost in the final of the previous leg in Swindon and climbed to fourth. The 30-strong field was split into six groups of five with only the group winners and the two best runners-up qualifying for the quarter-finals. Woking Snooker Centre hosts the sixth leg of seven on Sunday, March 27. Matt Ford: 66, 65, 62, 61, 57, 48, 48, 42. Nick Birney: 61, 56, 54, 48. Richard Swaffield: 60, 50, 41. GROUP A: 1st, Richard Swaffield (Salisbury SC); 2nd, Steve Ashton (Salisbury SC); 3rd, Stephen Hills (Traders, Northfleet); 4th, Nick Miles (Ashlett Club, Fawley); 5th, Jonathan Walker (The Potting Shed, Aldbourne). GROUP B: 1st, John Hunter (Salisbury SC); 2nd, Neil Carroll (Chandler’s Ford SC); 3rd, Richard Arnold (Salisbury SC); 4th, Martin Hill (Salisbury SC); 5th, Peter Chin (Woking SC). GROUP C: 1st, Ram Birring (Chandler’s Ford SC); 2nd, Jon Monckton (Woking SC); 3rd, Mike Talmondt (Copnor SC, Portsmouth); 4th, Paul Bateman (Crucible, Newbury); 5th, Chris Stocker (Sunninghill Comrades Club, Ascot). GROUP D: 1st, Jean-Marc Bancilhon (Camphill Social Club, West Byfleet); 2nd, Terry Azor (Chandlers Ford Central Club); 3rd, Ron Threadgill (Jesters, Swindon); 4th, Alan Thomas (Jesters, Swindon); 5th, Ray Mears (Sovereign SC, Farnborough). GROUP E: 1st, Matt Ford (Sunninghill Comrades Club, Ascot); 2nd, Wayne Muddiman (Chandlers Ford Central Club); 3rd, Trevor Thorn (Basingstoke Cons); 4th, Martin Luker (Jesters, Swindon); 5th, David Stewart (Chandler’s Ford SC). GROUP F: 1st, Nick Birney (Liberal Club, High Wycombe); 2nd, Paul Stenning (Park Gate RBL); 3rd, Christopher Howie (Shirley Cons); 4th, Martin Wallace (Crowthorne RBL); 5th, Paul Lawrence (Park Gate RBL, Southampton). QUARTER-FINALS (£15, 12 points): Birney 2 Bancilhon 1, Swaffield 2 Hunter 0, Birring 2 Carroll 0, Ford 2 Azor 0. SEMI-FINALS (£30, 15 points): Swaffield 2 Birney 0, Ford 2 Birring 0. FINAL (£120/£60, 25/18 points): Ford 2 Swaffield 1.